Age: 15 Birthdate: November 1, 1985 Blood Type: AB Height: 164 cm Weight: 50 kg Shinichi Okazaki is the bass player of Blast, and youngest member of the band, being only 15 years old. Shin was born in Sweden, he speaks British English with a Swedish accent. Due to his dysfunctional family, Shin left his home and abandoned his original family name. He moonlights as a male prostitute, with Reira being one of his clients. Among other things, he is an expert mahjong player and a confidant and early roommate to Nobu. He stops seeing Reira to protect her status and his own feelings—also possibly sparked from fear by Takumi's warning. 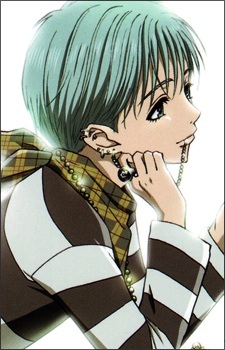 Ryouko Kawashigi, one of his older clients, bears a striking resemblance to Reira and he sees her again after the two musicians ended their relationship. She lives near his parents' apartment, works as a stewardess, and is the one that taught Shin "bad things". He and Ryouko were put under arrest for possession of marijuana which caused BLAST to withdraw from their tour. In the future it is shown he has become an actor.